Blade II is not as good as you remember. That is, assuming you even liked it in the first place. Back in 2002, I saw the film in theaters and liked it so much I rushed out to buy the DVD when it was released. However, revisiting the early Guillermo del Toro film this week didn’t bring back fond memories—but it still may be as important a Guillermo del Toro movie as anything else he’s done, right up to this week’s The Shape of Water. Like any good sequel, Blade II takes what fans liked about the first film, gives them more of it, and adds to the mythology. 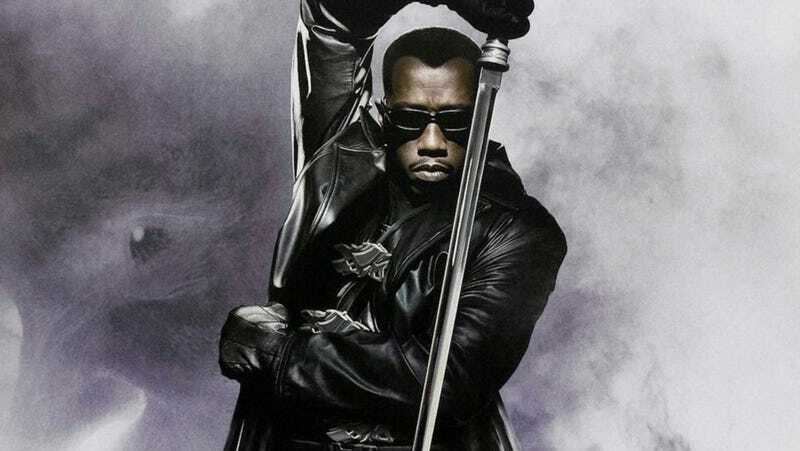 This time around, Wesley Snipes’ Blade teams up with a vampire army called the Blood Pack (who were trained to kill him) to stop an even worse threat—a hybrid species called the reapers, who feed on humans as well as vampires. The first thing I noticed rewatching Blade II was the supporting cast. Norman Reedus, in particular. In 2002, he was simply a semi-recognizable character actor, many years away from hitting mega-star status thanks to his role as Daryl on AMC’s The Walking Dead. In Blade II he’s the half-vampire/half-human’s right-hand man, Scud. Martial arts superstar (and Rogue One standout) Donnie Yen also has a small role, as does del Toro mainstay (and his then-future Hellboy) Ron Perlman. Watching vampires getting dusted is still a highlight, and, this being a del Toro movie, the practical effects and creatures are great. The way the chins of the reapers split open to form almost a preying mantis, complete with an H.R. Giger-esque alien popping out, is gruesome and totally awesome. The same can be said for the reaper makeup, the autopsy scene, and most of the violence that punctuates the action. All of that is very much in line with a talented filmmaker, who was quickly developing a very distinct vision. Unfortunately, the rest of the movie isn’t as interesting. The plot is essentially Blade fighting a bunch of people, then talking to a bunch of people, then fighting a bunch of people, then talking to a bunch of people, and keep repeating. Over and over. The twist is decent, but not that surprising. The film’s numerous and extended action scenes are passable, not because of the fighting itself, but because del Toro has a weapons fetish. Deaths are doled out with cool, unique gadgets—a sunlight grenade, stake gun, or poisoned wrist knives. Everything beyond that feels choreographed and illogical. Case in point: midway through the movie Blade and his Blood Pack are in a club fighting some reapers. They are unloading every weapon they have on these guys, bullets, blades, whatever... everything except the one that actually ends up working, which is the focused beam of light on the end of their guns. It takes forever until someone even thinks to turn on their light, and even then it’s not just an immediate “Hey, everyone use your lights and nothing else.” They still kick and punch and fire guns, when all they needed to do was flip a small switch and the battle would have been over. Now, this could arguably be explained by the fact that everyone in the Blood Pack except for Blade would also be mortally wounded by the light, but later in the movie, they find plenty of ways to get around this. Little things like this shouldn’t matter in a movie, but they start to stick out when the story gets so monotonous that your brain needs something to think about. And yet, throughout the movie Snipes is suitably badass. Reedus, Perlman, and Kris Kristofferson are all excellent. There are some excellent needle drops, including “Name of the Game (Calling All Freaks)” by Crystal Method. Plus, oddly, the film’s worst effects—long, wide shots of CG action scenes—are actually pretty endearing because at least they’re different from everything else. Blade II isn’t a failure by any means—it’s just one of those movies whose memory of it outweighs its reality. The reality, though, is that Blade II was a huge hit. It grossed three times its budget, which allowed more Blade movies to get made and allowed Guillermo del Toro to make a Hellboy movie, which then allowed him to make Pan’s Labyrinth (as well as another Hellboy movie). Sure, his early films like Cronos and Devil’s Backbone paved the way for Blade, but at that time Blade II was his biggest hit by far, making it a huge reason why del Toro is the filmmaker we know and love today. So even if Blade II doesn’t hold up, it’s still an important moment for one of fandom’s favorite directors. And for that, all is forgiven.